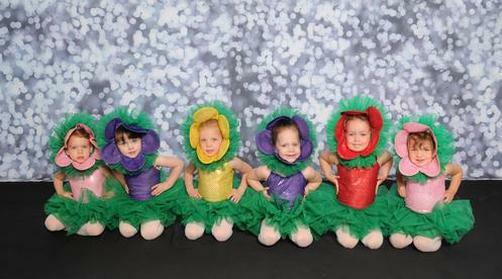 ​Dance, Music and Movement Classes for Your Toddler. We have Mommy and Me classes for ages 18 months and up! Convenient mom friendly class times! You can start today ! Mommy and Me classes involve lots of imagination and games to keep the interest and attention of young students. Children use large motor skill movements such as jumping, skipping and hopping, and are made aware of music and rhythm. Exercises for building physical strength and coordination are offered in a fun and nurturing atmosphere. No experience needed. Move and Groove 1 and 2: An introductory, ½ hour class, it is designed to get little ones up and moving with the help of their parent, guardian, or caregiver. Sing a long songs, creative props, and high energy will have your dancer moving and grooving. *Non-recital-based class. Move and Groove 1 is for 18 months to 2 years. *Move and Groove 2 is for 2-3 years. More classes that your toddler will enjoy! If you are looking for child only classes you have a few choices. First Steps™ - (age 2) - First Steps is a creative movement class that introduces toddlers to dance on a very elementary level. The teacher shows the students how to learn in a way that makes discovering movement, balance and listening skills easy and fun. Creative Movement: A light-hearted and fun class. Dancers develop grace, balance, and coordination through a series of basic movement and ballet basics. Join the fun while your little one enjoys the art of movement, expression music. *Non-recital-based class. Snack & Boogie: Geared toward our preschool aged kiddos (3-6 years), this class runs right after morning preschool times. Come enjoy a snack with your favorite teacher and get a fun dance class in before heading home for lunch. Basic dance moves, coordination, and music appreciation will be incorporated into an energizing class. *Non-recital-based class.